The 4300 North Marine Drive Condominium Building was built in 1931 as a luxury apartment tower. Photo by Eric Allix Rogers. Recently, while working on a survey of historic buildings along North Lake Shore Drive, I became intrigued by a high-rise at 4300 N. Marine Drive. With boldly contrasting red brick and cream-colored surfaces, and exaggerated Doric columns at its entryway, the structure is eye-catching, though a bit quirky in its design. Close-up of east façade. Photo by Eric Allix Rogers. A condominium building today, this was one of only a few lakefront luxury apartment towers that went up during the early Depression era. In addition to a fascinating development history, the building had a colorful cast of characters who resided there over the years, ranging from the noteworthy to the notorious. 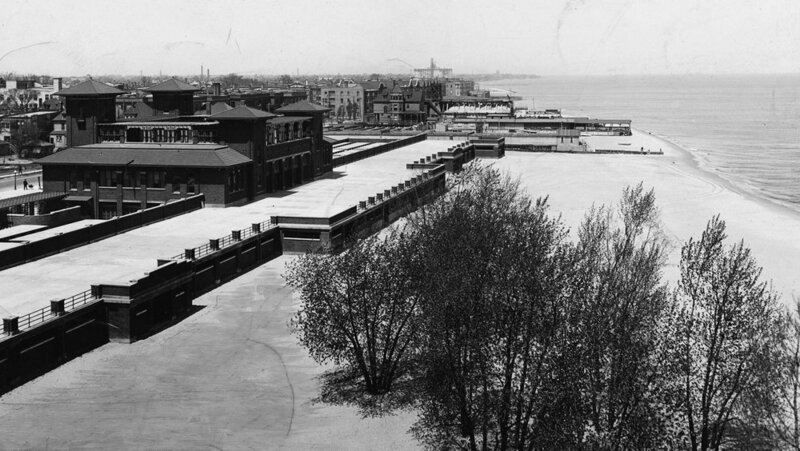 A real estate syndicate called the Murray Hill Apartment Corporation purchased land at the corner of W. Montrose Avenue and N. Marine Drive to build this structure 1929. (It seems likely that the investors named the building in honor of the fashionable Murray Hill neighborhood in New York City.) They chose an alluring location for their new Murray Hill Apartments. In addition to its close proximity to a vibrant commercial district in Uptown, the apartment tower would overlook the north lakefront. Clarendon Beach, directly northwest of the building site, had been a popular public beach for over a decade. Clarendon Beach Bathing Pavilion, ca. 1925. Courtesy of Chicago History Museum iChi29522. Although the municipal beach would soon be permanently closed, the Lincoln Park Commission had begun extending Lincoln Park from Montrose to Foster Avenues. This landfill extension project would provide additional beaches, a boat harbor, lawn areas, and a new stretch of Lake Shore Drive just steps away from the Murray Hill Apartments. Aerial view of Lincoln Park Extension with 4300 N. Marine Drive at lower left, ca. 1940. Chicago Public Library Special Collections, Chicago Park District Archives, Photos. Johnck & Ehmann designed the 1928 Donmoor Apartment Hotel at 917 W. Eastwood Avenue. Photo by Julia Bachrach. The investors selected architects Johnck & Ehmann to design their building. Born in Iowa, Frederick Johnck (1878-1970) had moved to Chicago with his family in the 1890s. After studying architecture at the School of the Art Institute, he worked as a draftsman in Brooklyn and then moved to Birmingham, Alabama, where, in 1909, he had a brief partnership with architect J. Louis Putnam. Johnck returned to Chicago and obtained his Illinois architectural license in 1912. By 1918, he was working in the office of George C. Nimmons (1865-1947), a noteworthy Prairie style architect. In the early 1920s, Johnck and William F. Ehmann (1893-1972), whom he had met in Nimmons’ office, formed their own firm. Though never prolific, Johnck & Ehmann produced plans for a number of fine homes on the North Shore. They also designed the annex for the Patrician Apartments at 405 W. Fullerton Parkway and the Donmoor, an apartment hotel at 917 W. Eastwood Avenue. View of building’s east facade. Photo by Eric Allix Rogers. Johnck & Ehmann included several Colonial Revival style elements into their design. For instance, decorative quoins enliven brick corners and limestone surrounds; broken pediments with urn reliefs rise above several upper story windows; the entranceway has a magnificent fanlight window with ornate sidelights; and the front foyer’s interior design expresses the style. Left: View of interior doorway with fanlight window and sidelights. Right: Foyer. Photos by Eric Allix Rogers. But the architects also incorporated Neoclassical elements into the exterior facades—most notably, the colossal Doric columns that support a Classical portico. Along with these historical references, the building’s design has a modern flair. This is demonstrated by its strong sense of verticality and bold two-tone scheme; the entranceway’s asymmetrical placement; and geometric details such as chamfered corners on prominent window openings and octagonal relief elements below the fourth story windows. Close up looking southwest. Photo by Eric Allix Rogers. Classified Ad 7, Chicago Daily Tribune, Feb. 8, 1931, p. E6. Music Box Theater. Photo courtesy of Wikicommons. During the 1930s, some North Side luxury high-rises would not rent apartments to Jewish tenants. However, the managers of the Murray Hill Apartments did not discriminate, and the building had both Jewish and gentile tenants. Among the building’s early residents were Jacob Lasker, owner of such movie theaters as the Music Box Theater on N. Southport Avenue, and Nathan Jameson, president of Arrow Mill Company, manufacturers of battery separators. Prominent early tenants included Dr. Frank E. Schram, a decorated military surgeon, and Charles W. Schick, a commander in the U.S. Naval Reserves and a national leader in the American Legion. Among the building’s most colorful early residents was Titus Haffa (1893- 1982) who lived there with his wife Ethel. Haffa rose from newsboy to machine shop owner to realtor, eventually becoming one of Chicago’s wealthiest industrialists. He was elected as alderman in 1927, and convicted of bootlegging three years later. Despite having served time in federal prison, Titus had so much clout that President Roosevelt granted him executive clemency for the conviction. In the early 1940s, Milton and Amanda Brunhild, owners of a national chain of butcher shops, purchased and moved into the high-rise. The couple renamed the building Brunhild Towers. Amanda Brunhild played a prominent role in many Jewish charitable causes, often hosting meetings and fundraising events in their apartment. Sometime after Milton died in 1949, Amanda married a realtor named William Robinson. Amanda Brunhild Robinson continued to own and live in Brunhild Towers for the rest of her life. The building’s spacious apartments have spectacular views of Lincoln Park and the lakefront. Photo by Eric Allix Rogers. Over the decades, several residents of 4300 N. Marine Drive had ties with the underworld. These included Les ‘Killer Kane’ Kruse (1912-1976), Gus ‘Slim’ Alex (1916-1996), and Edward David ‘Dutch’ Vogel (1895-1977). According to the American Mafia website, Kruse oversaw gambling rackets in Chicago’s northern suburbs. He and Alex helped “fix politicians and judges on behalf of the Outfit.” Gus Alex controlled illegal gambling and prostitution operations in the loop. Vogel was the boss of a syndicate that held a monopoly on slot-machines, juke boxes, and cigarette and other coin-operated machines. In the late 1950s, both Vogel and Alex were subpoenaed to appear before the notorious Senate Labor Rackets Committee, for which Robert F. Kennedy served as chief counsel. Not surprisingly, neither had much to say. In fact, Alex pled the Fifth Amendment over 39 times during his questioning. View of hallway. Photo by Eric Allix Rogers. An equally high-profile, than far more upstanding, resident was Robert E. Cherry (1907-1980). A lawyer who began his political career as a ward precinct captain in the 1930s, Cherry served as Assistant Attorney General of Illinois from 1949 to 1953. Two years later, he was elected as an Illinois State Senator, serving until 1973. As a Democratic senator, Cherry sponsored legislation to protect children from abuse and improve public education. He became a circuit court judge in 1974. Cherry lived in the building for over twenty years until he passed away in 1980. To honor him, residents planted flowering trees in front of the building. I hope the next time you pass by this remarkable historic building, you’ll have a new appreciation for it. If you are fortunate enough to reside here or if have friends who do (as I have), you may pass through its halls and wonder what the walls would say if they could speak. Did Gus ‘Slim’ Alex still live here when Robert Cherry moved in? And if so, it makes you wonder, did they ever pass each other in the hall?